The Bragi Dash was, in our eyes, the original hearable. It started out as a crowdfunding darling before actually coming out and winning back-to-back Hearable of the Year prizes at the Wareable Tech Awards, succeeded by the Bragi Dash Pro. That's a lot of praise, so if you're considering whether to pick up the Dash Pro, pick up the original Dash on a deal, or just want to know exactly what they can do, here's our breakdown of what the buds are capable of, plus a few tips that will make them even easier to use. Any questions? Let us know in the comments section below. What is Bragi Dash and Dash Pro? Technically, we should be calling them Bragi The Dash, but we imagine most people are more used to them being referred to as Bragi Dash. They're Bragi's first-generation hearables. The second generation, which is a re-engineered version of the original, is called Bragi Dash Pro. Like Apple's AirPods or Samsung's Gear IconX, they are set of truly wireless earbuds so there's absolutely no cables flailing around or in between. Compatible with iPhones and Android phones, you can stream music from them, answer calls and track three sports; running, cycling and swimming. They also work as an MP3 player so you can load up music and leave your smartphone behind at home. The Dash Pro is available in two different versions. There's the regular Dash Pro, which comes in at $329, which comes with all the smart features an inEar assistant. Then there's the Dash Pro Tailored by Starkey for $599. The big difference, and the reason for that massive price hike, is that you can go ahead and get an injection mold of your ears so that your Dash Pro perfectly fits. If you just want something a little more basic, Bragi also has The Headphone, which is a pair of wireless buds that cost significantly less than the Dash. It costs $149. However, it does lack the activity tracking and live translation skills of its bigger brother. If you're just going to use the Dash Pro to listen to music from Spotify, Apple Music or another music streaming service then pairing is really easy. It's essentially the same as connecting a pair of Bluetooth headphones. Once they're all charged up, there's proximity sensors that are able to detect when they've been taken out of the charging case and turn themselves on when you pop them inside your ear. Go into your Bluetooth settings on your smartphone and search out for the Dash name, hit connect and you should be good to go. To tinker with all of the settings and activate sports tracking modes, you'll need to download the Bragi app where you'll be able to calibrate the earbuds. It's worth noting that when you need to update to the latest version of Bragi's OS, you'll need to drop them back into their case and plug it into your computer using the micro USB cable. There's also a Bragi Dash installer program you need to download to get those new features and fixes over to the Dash earbuds. What can Bragi Dash Pro do? Quite a lot ,and we're going to start with the sports tracking first because that's what really makes the Dash Pro a bit special. Packing in a series of motion sensors, including accelerometers and gyroscopes in both buds, the Dash and Dash Pro are able to record a collection of metrics. That includes distance covered, steps, average pace and calories if you're running with them in. For swimming, it'll measure breathing rate, thanks to the onboard pulse oximeter sensors, pool lengths and duration. When you go cycling it'll also record cadence and duration data. Both the Dash and the Pro will automatically start tracking workouts too. This is a wonderful idea, but in practice we found it a bit temperamental. In addition to recording motion, there's also an optical heart rate sensor as well that works in a similar fashion to the one included in Jabra's heart rate monitoring Sport headphones. This means you can get an indication of workout intensity across the three supported sports. Unfortunately, there's no GPS on board either the old Dash or the Pro and you can't feed data into third party apps like Strava or Runkeeper (yet). You can enable the app to share location data to improve tracking accuracy. You're going to get a better music experience on the Pro compared to the previous generation Dash. You'll not only get an hour extra of battery life, 5 hours for the Pro versus 4 for the original, you're going to get a much fuller, bass-filled listening experience. They both still have 4GB of storage to load up tracks, which must be done via your computer. The waterproof design also means you can use them for swimming, too. Just make sure you've put on the right sleeves before you jump into the pool. When you first try them out, you might feel like they are a little on the quiet side, so make sure you head into the Bragi app and tinker with the Master Volume and you should get a lot more power. If you're working out with the Dash buds plugged into your ears and don't like the idea of drowning out the world around you, there's a useful audio transparency mode that'll let you hear your surroundings. It also means you can still listen to music and have a conversation with someone at the same time. One of the most exciting things about hearables is the potential they have for giving us real-time translation, the dream of talking to someone in another language and having it automatically translated for you. This is kind of how it works on the Dash and Dash Pro. You will need your phone, the iTranslate app and the $14.99 iTranslate Pro subscription. Once you do that, getting it set up is a bit of a hassle. You'll need to put your Dash Pros on, then open up the app, then find the Bluetooth button and select the Dash Pro, which sends you back to the Bragi app to connect. It's all a bit much. Once you have it all set up, there are two ways to translate. You can have one person wear the buds and hold out the phone, with the app open, and have it translate that way. Or, you can go bud-to-bud. However, this second way requires both people to have a pair of Dash Pros. This is neat, but probably isn't a realistic outcome when you're out exploring a foreign country and need to speak to a local. In our test, we found that it mostly worked pretty fine. While it was a hassle to set up and it sometimes missed things, it mostly had us conversing with a friend relatively seamlessly. Bragi has adopted the philosophy of rolling out software updates to improve what the Dash are capable of. A big feature on the way will add 360-degree 3D audio, which uses the audio transparency feature and turns it into a mixed reality feature. It's being developed in partnership with Starkey, a hearing aid manufacturer who also helps custom fit those Tailored by Starkey Dash Pros. It aims to create a sense of directional sound around you, which would be a good fit for watching movies, virtual reality or even navigation. With no cables to place an inline remote, Bragi relies on using optical touch sensors, which are placed on the outside of the earbuds letting you swipe and tap to control music playback features, activate sports tracking modes, turn on the audio transparency mode or launch smartphone assistants like Siri and Google Assistant. 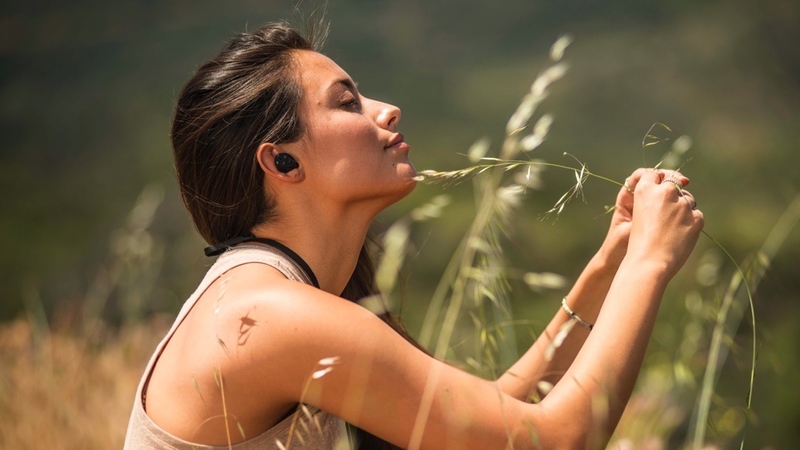 Bragi has also introduced a set of new control options that the company is calling the Kinetic User Interface, that is able to use gestures that don't require touching the buds at all. So you can shake your head to skip a music track, nod to answer a call, and even use head gestures to navigate the Dash menus. These are more trouble than they're worth at the moment, but it still works and is usable. There's a feature called MyTap on both the Dash and Dash Pro that allows you to tap your cheek so that you can activate Siri, Google Assistant or, more recently, Alexa. Speaking of Alexa, the company has updated both its old and new generation of buds with Alexa support. So you can use her and all her thousands of skills to do things like call an Uber or even listen to Amazon Prime Music. If you are planning to go swimming make sure you use the biggest sleeves included as these will ensure they stay secure in the ears. We'd even suggest wearing them underneath a swimming cap for that added touch of security. Good luck trying to stream music via Bluetooth with your phone nearby because it just doesn't work. You'll need to bring the music player feature into action, which can be summoned from the right earbud. Hold the right bud down for one second to access your playlist and you can find out the key music playback features here. The one problem we found running with the Dash is that the touch controls are very sensitive and are easily set of. To lock the controls, hold down on both the left and right buds at the same time. You can entirely bypass the app to start recording a run, swim or cycling session simply by pressing down on the left bud for more than one second and double tapping to skip through the activities. When you're ready to go, tap to confirm the selection and get moving. This is a really handy feature to determine whether you need to top up before leaving the charging case behind. Give the buds a little light shake and the notification lights on the outside illuminate to determine battery level. Blue means full, green is high, yellow is medium and red means get charging. You can use the right earbud one its own in a standalone mode simply by double tapping on the touch controls. Perfect if you only have a bit of power remaining on the left one.